Whenever translational motions need to be performed dynamically, with low friction and high flexibility, users choose linear systems.The core of the LinMot drive system consists of the control electronics, the servo drive, and the linear motors. 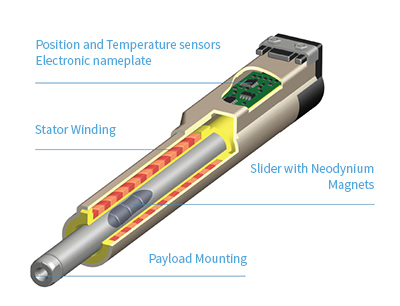 The standard variant of the linear motor can be used universally, covering a wide range of applications. Many different positioning tasks in the low-voltage range can be performed using the compact drives. The family of motors includes 3 models with various lengths of the stator and the stroke. The user can select a maximum stroke length of 1830 mm and peak force of 1024 N. Because the motor components are encapsulated, the motor is optimally protected, even for intensive applications. The High Performance line of linear motors have significantly greater performance than standard motors with the same component size and identical dimensions. This is largely due to the ongoing development of the motor windings and the magnetic circuit, and the use of high-performance materials. With High Performance motors, the user has access to nearly double the nominal performance. The higher performance in the same form factor allows power to be increased in existing machines and systems without the trouble of mechanical redesign. This type of motor is the shortest form factor for LinMot linear motors. Short motors have been developed especially for applications with limited space constraints. The short form factor also means that multi-axis applications can be implemented with several stators on one slider in a very small space. In order to provide the designer with as many options as possible for cable routing, these motors are provided with three covers for the cable outlet on the left, the right, or the front side. The motor cable can be plugged in under the cover for quick and easy installation. The linear motors of the P10 series are the most powerful motors in the LinMot product family. With their higher performance and peak forces of up to 2700 N, the motors place higher demands on the drive units and servo drives. For this reason, Lin- Mot has developed a completely new concept and relies exclusively on the 3x400VAC technology and servo drives with direct power supply from the grid for this motor series. Depending on the application, the motors can also be operated with rectified 1x230VAC. The built-in standard encoders ensure better integration of the drives into external control concepts. The motors can thus be controlled by drives of any manufacturer without problems. As with the smaller drives, the motors are equipped with rotatable IP67 plugs. For the different stroke lengths there is a fixed, systematically ordered slider program. The motor family P10-54 consists of compact, tubular linear motors of medium power output for dynamic positioning tasks or to replace pneumatics. Optionally equipped with a 1Vpp Sin/Cos encoder or an A/B incremental encoder, the motors can be controlled by any manufacturer’s drives. The linear motors of P10-70 series are the most powerful LinMot motors for dynamic linear motions. They can be actuated by any manufacturer’s drives or by the LinMot E1400 and C1400 Servo Drives. The linear motors of the type P04 have all the advantages of tubular linear motors and additionally offer the advantage of an integrated guide. The P04 actuator can be equipped with the mechanical accessories known from pneumatics. This makes the replacement of pneumatics even easier, as all mounting options known from pneumatics can be realized. With its free positionability and accelerations of up to 50 m/s2, dynamic and precise movements are the main discipline of this motor type. In addition, transverse loads are absorbed by the integrated bearing so that simple applications like « Pusher » can be realised without additional components.